Dimensions: W-48" X L-48" X H-55"
This Larson Electronics 75KVA Power Distribution Substation has a 600 amp three phase 480 volt main breaker panel and a 200 amp 120/240 main breaker panel. Both panels are rated Nema 3R. 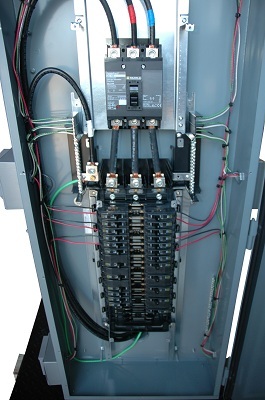 Four 480V 3 wire 4 pole receptacles are protected by four 125 amp breakers within the three phase panel. Eight duplex 120V outlets are protected by eight 20 amp breakers and five L6-30 240V receptacles with watertight covers are protected by five 30 amp breakers in the single phase panel. The customer provides an SO cable that brings 480V three phase power to the 600 amp three phase 480V Nema 3R breaker panel. 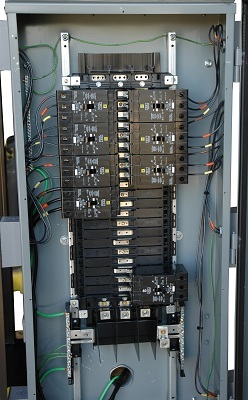 Four 125 amp breakers protect four 3 wire 4 pole 480V receptacles with mating plugs. 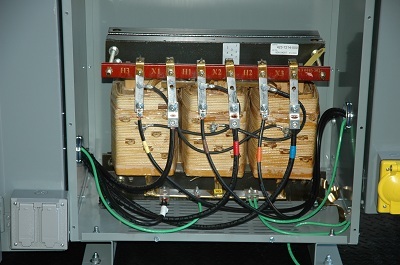 A 125 amp breaker protects the Nema 3R configured 75KVA transformer. The 480V three phase to 120/240V 75KVA transformer delivers 120/240V to the 200 amp Nema 3R main breaker panel. Eight single pole 20 amp breakers protect 8 duplex 120V outlets. Five single pole 30 amp breakers protect 5 240V L6-30 outlets with watertight covers and mating plugs. The transformer is mounted on a 1/8” thick steel diamond plate mounting platform and the load center/distribution assembly is mounted to the standard 2 inch square carbon steel tubing frame, resulting in an extremely stable, durable, and well protected power distribution platform. This model is equipped with 4 heavy duty polyurethane 8 inch casters and a top located lifting eyelet allows easy lifting with cable or chain hooks. This power distribution system is ideal for indoor or outdoor use and applications including but not limited to, construction sites, plant maintenance, plant turnarounds, hazardous location operations, shows, exhibits, and shipyard operations. These power transformers are popularly used in applications where external power sources are often necessary and work well in combination with explosion proof lights and equipment. Larson Electronics is a manufacturer and as such can build portable transformer systems to your specifications. Although we carry several models of power distribution transformer systems, we can deliver custom ordered units almost as quickly as our prebuilt units. If this model does not meet your needs, please contact us at 1-800-369-6671 or sales@larsonelectronics.com to discuss your specific requirements.